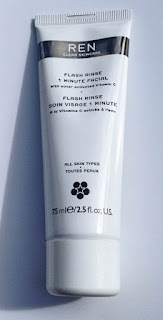 REN Flash Rinse 1 Minute Facial is a product that has been on my radar ever since it was launched last year. I was really intrigued by its claims to deliver the results if a facial in 60 seconds. I resisted buying it until now because I have had a lot of skincare products to use up first, but if you've seen any of my recent empties posts, you will know I have finished a lot of skincare products in the last few months so I could justify this purchase! Anything that claims to reduce signs of fatigue will always be put to the ultimate test on me! 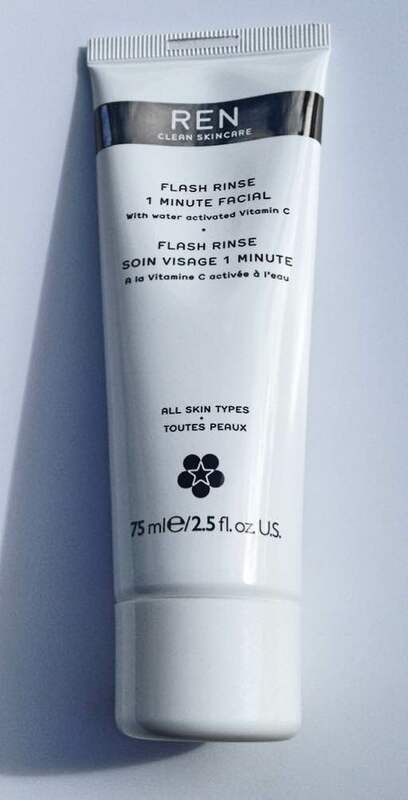 It also claims that your skin will be left glowing after use with renewed radiance - all of these claims are what I want for my skin so I was eager to give this a try. After cleansing, a small amount is massaged into the skin in a circular motion, before wetting the fingers and then massaging the product in, which activate the Vitamin C in the product. Then it is left for 1 minute before being rinsed thoroughly. It feels very like Dermalogica Thermafoliant if you have ever used that - it has a creamy/mildly gritty texture, but nothing that tugs on the skin. I have sensitive skin so I am always anxious when trying new exfoliating products, but I needn't have worried with this product because I didn't experience any tingling at all. After rinsing the product off, I noticed that my pores looked a little tighter on my cheeks, which is always good, and it left my skin feeling very smooth. I followed up with my usual skin care routine and I have been using it every 3 days. A little product goes a long way with this so I expect it to last quite a while. I like this product but I have to say that it isn't as great as it claims to be. The results are not better than I get from my usual exfoliating masks, but it does the job a lot quicker and it is only one product as opposed to 3/4. If I were to do my favourite skincare treat of a Triple Threat Facial it would take me approximately an hour, so in that respect, there is no comparison because this only takes 1 minute! This product is perfect for busy people who do not have lots of time or money (or even the inclination!) to spend on a number of products when one will do a pretty similar job, but I can't say that I will repurchase because I simply prefer other products in my collection and don't mind spending time on my skincare routine. Have you tried this product or would you be tempted by it?